It's Ducky Derby Time Again! Ducky Derby is the signature fund raising event of the year for Camas Washougal Rotary. The event brings the community together to watch the ducks race on the Washougal River. 5000 sponsored rubber ducks race to the finish line. The first duck over the finish line means the sponsor wins a trip to Hawaii plus $1,000 toward airfare. There are many other exciting prizes. All of the proceeds support local scholarships and projects, so everyone is a winner. The Rotary Club of Camas Washougal is proud to host the 24th Annual Ducky Derby. Tickets are available now until the time of the race on Sunday, July 29, 2018, at the Third Avenue Bridge in Camas, where the race takes place. Thanks to the Nutter Corporation, a front loader will ensure that all the ducks get dumped as a unit and the river will take care of the rest to make for another exciting race. The community is invited to view the race at noon. (People and/or pets will not be allowed in the water during the race because of regulations.) It's a fun time and the weather is always great. 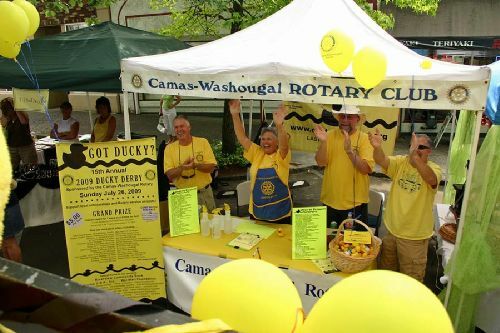 Ducks may be purchased during Camas Days from the Rotary Ducky Derby booth or from any Rotarian. The tickets are $5.00 each. All of the proceeds support Rotary projects and local scholarships. Last year the duck tickets sold out during Camas Days, so be sure to get yours early! Thanks to all of our many sponsors who make the race possible.